If you’re a regular reader of this column, you’ll know I’m very fond of old movies. I was thinking about what I could do next for My Favorite Things, and what sprang to mind was a couple of months talking about old musicals – after all, the very title of this column comes from an old musical! So today, I thought I’d discuss one of my favorites, a movie I’ve watched again and again and one that never palls. 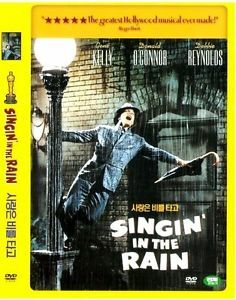 The immortal Singin’ in the Rain, directed by Stanley Donen and Gene Kelly, released in 1952. It might surprise you to know that this beloved film wasn’t an instant success when it came out – and it won NO Oscars! I wonder if the movie’s satirical tone turned early audiences off – that smart, ironic wit has made it shine ever since. 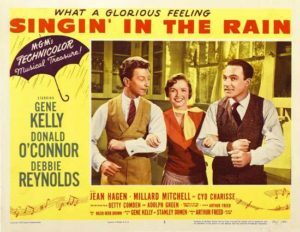 There’s so much I can praise in this wonderful movie, starting off with Betty Comden and Adolph Green’s sharp as a tack screenplay. They have enormous fun with the eccentric characters who populated Hollywood in the silent era and who then struggled to transfer their careers to the talkies in 1927. They have almost as much fun with the primitive technology of the early sound films, where actors had to talk into bushes or corsages rather than to their costars. There’s the supporting cast which is incomparable. Donald O’Connor (Cosmo Brown) gets most of the limelight when people talk about star turns in this movie – check out his Be a Clown number and you’ll see why. But for my money, the funniest person in the whole film is stupid but cunning star, Lena Lamont, played for all she’s worth by Jean Hagen. Lena has a voice that could strip wallpaper and an ego the size of the Grand Canyon. What’s not to love? She also has a lot of the best lines (including one of my favorites about having to make love to the bush with the microphone in it). 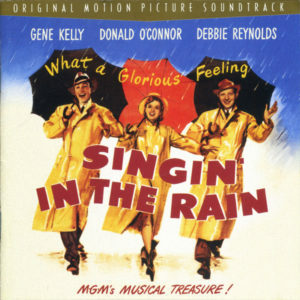 The two stars are Gene Kelly (Don Lockwood) at the height of his powers and Debbie Reynolds (Kathy Selden), who is too young for him, but who cares? They’re lovely together, especially in the early scenes when she’s pretending she’s an artist a cut above a mere movie actor. Someone else worth mentioning is the gorgeous Cyd Charisse, who is the femme fatale in the final ballet. Wow, legs up to the wazoo or what? The score is wonderful, too – full of hits from the 1920s. A particular favorite is Moses Supposes His Toeses are Roses when Don and Cosmo make mockery of a hapless elocution coach, hired to bring the silent actors of the era up to speed with spoken dialogue. And who could ever forget the title number with Gene dancing his heart out through the rain in a love-sick trance? 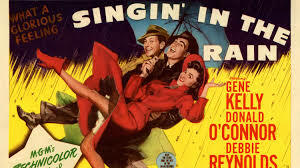 Just a bit of trivia – Singin’ in the Rain was produced by Arthur Freed who headed up his own (and legendary) unit at Metro-Goldwyn-Mayer, the same Arthur Freed who wrote the lyrics to Nacio Herb Brown’s music for most of the songs included. The score is so rich that wonderful songs like Temptation and The Wedding of the Painted Doll are only squeezed into montages. Whenever I watch this film, I think how incredibly entertaining the musicals of this era are. They’re not pretentious, but nor are they dumbed-down. Everything is absolutely topnotch, from the singing and dancing down to the most minor supporting player, and the production values are second to none. People often say, “They don’t make films like that anymore.” Well, sadly they don’t – this concentration of skill and talent in one place with an assured and broad audience went the way of the dinosaurs when the studios closed down. But luckily, we have films like Singin’ in the Rain still to enjoy. There’s a reason they call this film a classic! Some years ago, I had a dinner party with watching this film as the planned entertainment afterwards – too many of my friends had never seen it. I always smile to know that at least one of those friends has now decided that Singin’ in the Rain is her favorite film EVER! There are some days when I might even agree with her. If you haven’t seen it, choose a Sunday afternoon, a couch, something nice to snack on, and settle down for the most fun you’ll ever have with Technicolor!